FAQ: Street Fighter V Collector's Edition Ryu Statue - Multiverse Studio Inc.
Where can I purchase this statue, and how much does it cost? This statue is only sold with the Street Fighter V Collector's Edition for the PlayStation 4, which retails for approximately $99. The statue cannot be purchased on its own. What is the statue made of? The statue is made from durable PVC plastic and confirms to ASTM Safety Standards. It is safe for kids, but we do not recommend it for children under 13 years of age. How is the Ryu statue assembled? 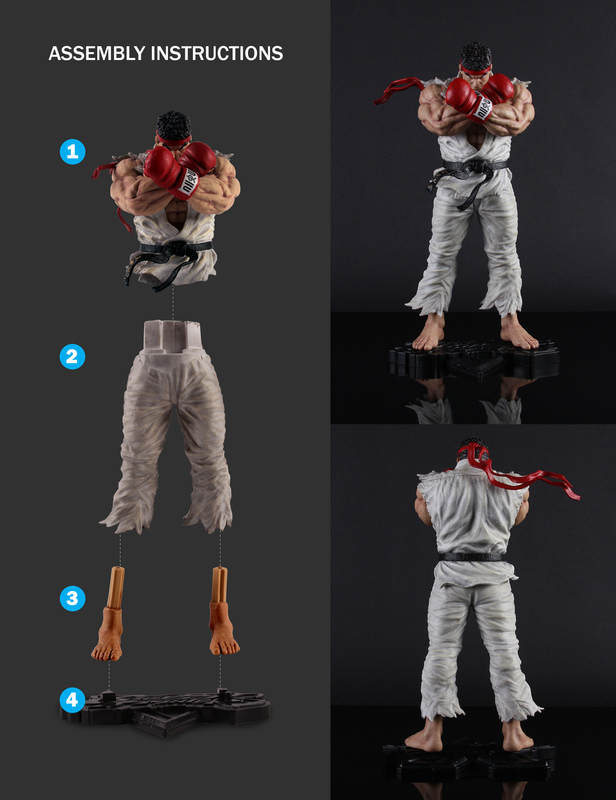 The Ryu statue is assembled starting from the torso to the feet. Once the statue is fully assembled, attach the base to the feet. Where are Ryu's feet, and why were they separated from his legs? Please check the side of the polystyrene foam block that encased Ryu's legs and base. The feet were packed separately because of size constraints of the packaging.